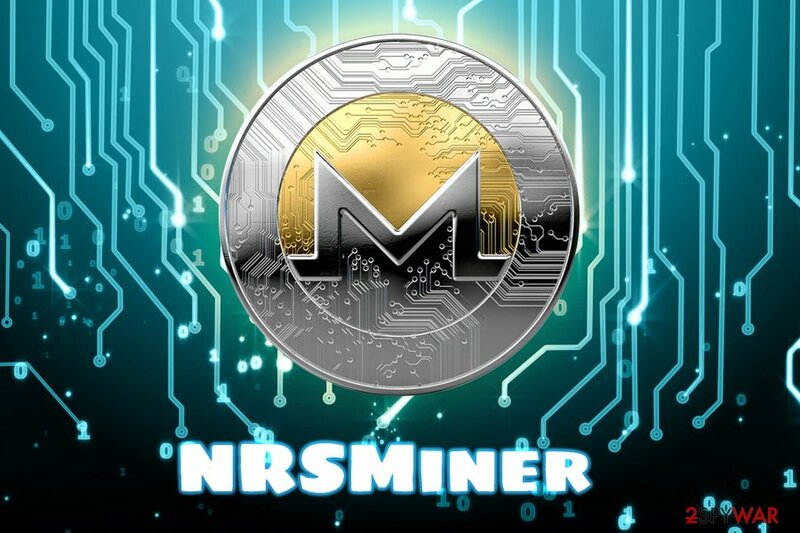 NRSMiner is a cryptojacking malware that uses computer's resources like CPU to mine Monero for cybercriminals. First spotted by security in early January 2019, it was seen attacking Asian countries by utilizing EternalBlue (CVE-2017-0144) – the infamous NSA exploit that was used to propagate WannaCry ransomware globally back in 2017. NRSMiner is closely related to XMRig crypto mining utility, which on itself is legitimate software, although heavily abused by bad actors. It spreads through networks and also can be delivered to companies with the help of unlawful installation by third-parties. 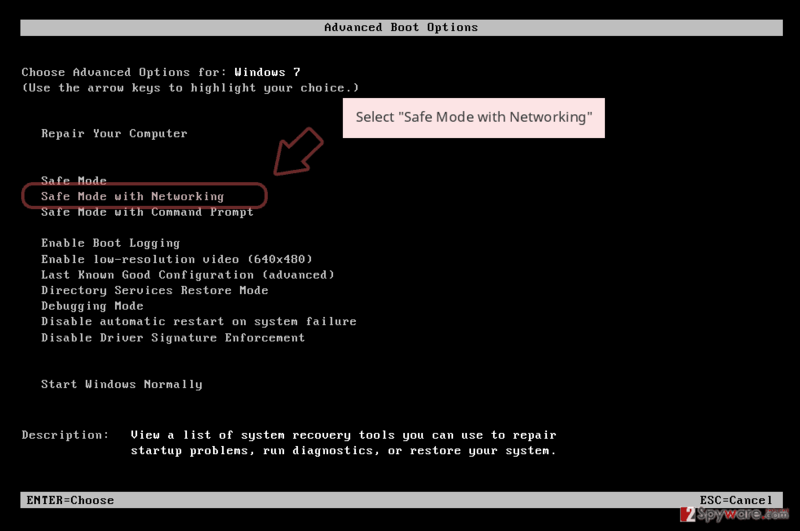 The malware modifies system heavily, spawns multiple processes and connects to a remote server to receive constant updates. Currently, NRSMiner is considered one of the most successful cryptojacking attacks that are most likely due to the increase in scale in the future. If the system is unpatched (MS17-010) and another system within the intranet has been infected by NRSMiner. If the system is infected with one of the previous variants of the virus, it will contact a specific website to download an update module. Soon after that, it will install the newest version and remove NRSMiner which was located on the system. Creating MgmtFilterShim.ini and running Wininit.exe, etc. If NRSMiner malware is using EternalBlue to propagate, it will also install DoublePulsar backdoor onto the vulnerable system which then downloads and extracts x86.dll or x64.dll modules, depending on the Windows system version. Users will generally not understand if they are infected with malware unless they notice the high usage of CPU, which might be attributed to something else. Nevertheless, the best way to detect the threat is to perform a full system scan with the help of security software. After NRSMiner removal, users should use Reimage to make sure that all the system changes are reverted and the computer works normally. According to researchers, the malware mostly affects Vietnam, Iran, and Malaysia – a total of 83.3% of all infections are coming from these three countries, making it especially dangerous for those in Asia. The most likely reason is due to companies and businesses using outdated systems that are not patched. 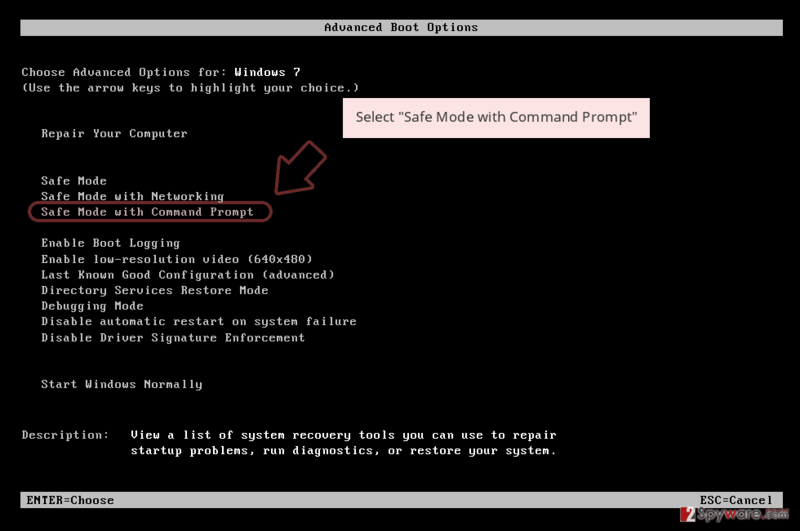 Since the threat is spread with the help of EternalBlue, the best way to prevent it is to renew the systems and make sure they are up to date. 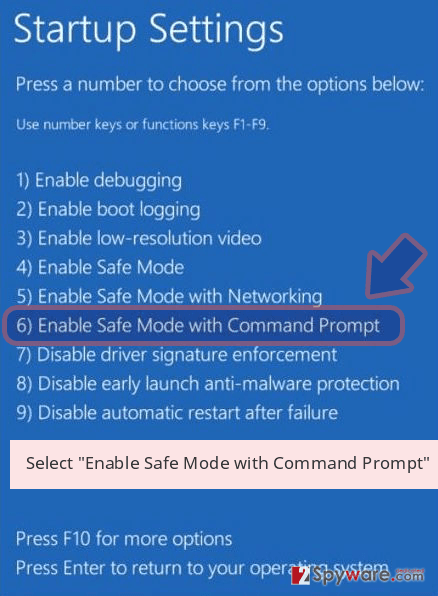 Security patches are released continuously for Windows, so there is no need to delay the installation. Unfortunately, as we saw from previous examples, users all over the world fail to apply updates on time and get infected with various malware. Therefore, patch your system immediately. 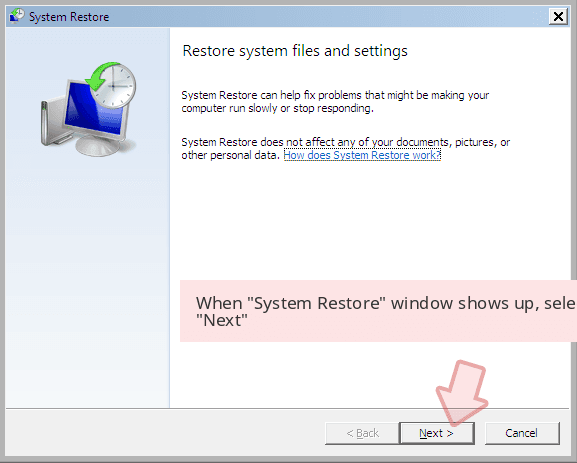 Set your Windows to install updates automatically – you will not have to look for a patch somewhere on the internet. 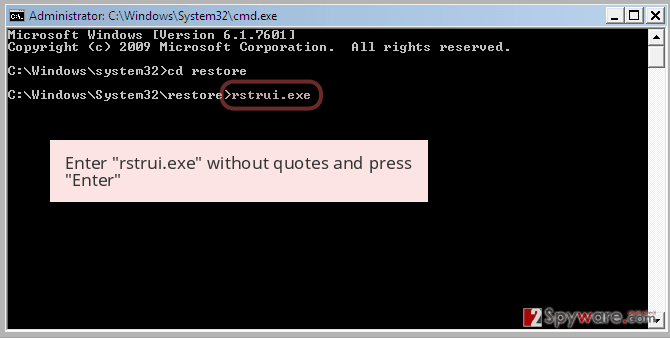 Besides, third-parties can host fake updates, bringing in more malware to your machine. 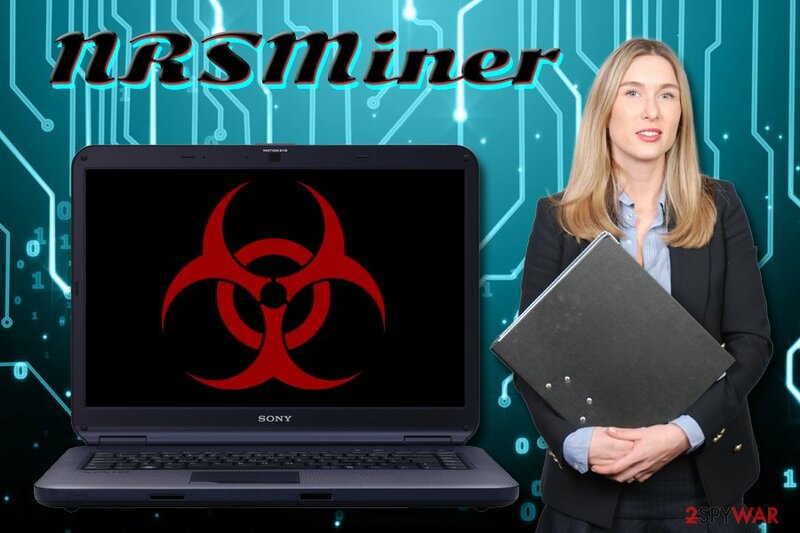 NRSMiner virus is a sophisticated infection that is capable of propagating via the intranet. Therefore, even patched systems might get infected rather quickly. For that reason, experts do not recommend manual NRSMiner removal, as the system modifications the malware produces are excessive. To remove NRSMiner safely, we suggest you download and install security software that can detect the threat. Be aware that not all databases have the virus included, so scans with a few different AV engines might be needed. 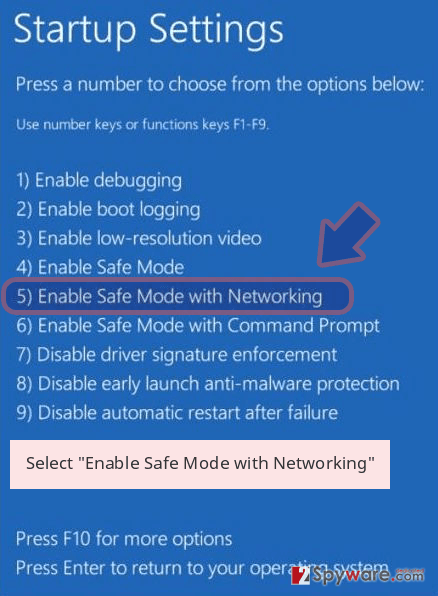 To ensure that the malware does not interfere with the security program's operation, you might want to enter Safe Mode with Networking, as explained below. Log in to your infected account and start the browser. Download Reimage or other legitimate anti-spyware program. Update it before a full system scan and remove malicious files that belong to your ransomware and complete NRSMiner removal. 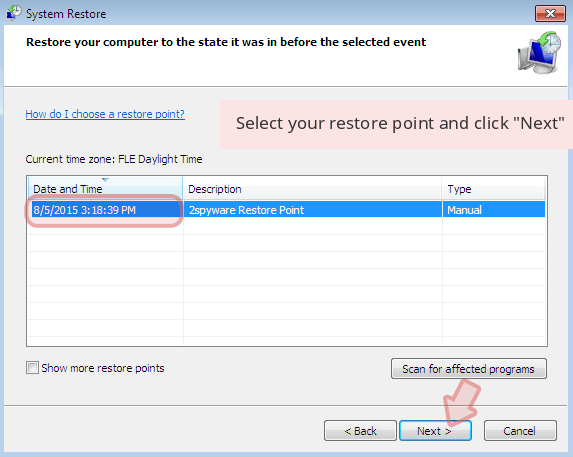 When a new window shows up, click Next and select your restore point that is prior the infiltration of NRSMiner. After doing that, click Next. Once you restore your system to a previous date, download and scan your computer with Reimage and make sure that NRSMiner removal is performed successfully. ^ CVE-2017-0144 Detail. 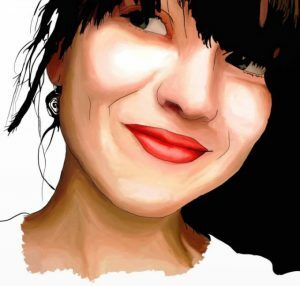 NIST. National Vulnerability Database. ^ Neeraj Singh. NRSMiner updates to newer version. F-Secure. Security blog. ^ Doug Barney. The unrelenting danger of unpatched computers. Networ kWorld. Network news, trend analysis, product testing. This entry was posted on 2019-01-30 at 04:15 and is filed under Backdoors, Malware, Viruses. You can quickly scan the QR code with your mobile device and have NRSMiner manual removal instructions right in your pocket. How did you remove NRSMiner?